I'm not quite sure what happened to the background color but in person it's much closer to the bermuda bay in the challenge. I was inspired by the swirl of floral up the side of the cake so that's the focus of my card. 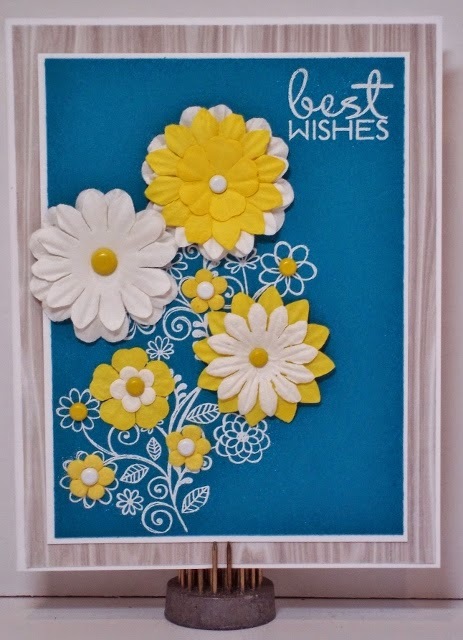 I layered several paper flowers on top of a white embossed stamped image. Lovely floral collage! Thanks for playing along with us at Color Throwdown! Love your fleur background and all those flowers! Thxs for joining has at CTD!! Oh my, those flowers are GORGEOUS! Thanks for joining us for the Color Throwdown.